Blue Sky Landscape is a licensed and insured for designing, installing and repairing your irrigation system or sprinkler system in all of North Texas. 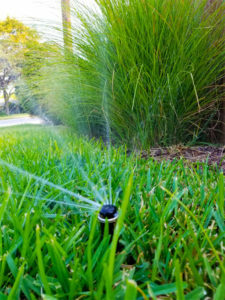 As a preferred Hunter® irrigation sprinkler system provider we use the latest in techniques and technologies for saving you water, money and time. While adding to your property value and beauty. We design your irrigation system around your unique needs. Whether its a sprinkler system, drip irrigation system, drainage or all the above. We start with detailed drawings that take into account each zone and the moisture needs of the soil and vegetation. We then present these plans to you for feedback and possible adjustments. Then installation begins. Using the industry standard parts and equipment we’re not guessing because we have a carefully coordinated plan that make installation fast and efficient with minimal damage to your existing grass, plants and trees. We follow up after the job is done to show you how the whole system works and adjust any of the concerns you have. As time passes you’ll have issues with your system broken sprinkler heads, misguided digging, additional landscaping changes or simple shifts in the underlying soil. Let our friendly, knowledgeable pros diagnose your problem. We’ll carefully estimate your cost and when we reach an agreement we’ll get right on the repair or replacement needed. Have use give you a quote on an new irrigation system or existing sprinkler system repair for your home or business, call today! Contact us today to see what we can do for you and your lawn or garden. Hunter® is the registered trademark of Hunter Industries who retains all rights to said trademark.